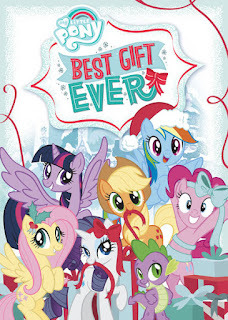 After eight seasons, a theatrically released movie, a series of spin-off movies and shorts, comic books, and soundtrack albums including a non-canonical Christmas album, you’d think My Little Pony had done everything. But what it hadn’t done until this year was a holiday special. Best Gift Ever is that hour-long (45-ish minutes) special, and I’m happy to report that it’s so good that we’re thinking of adding it to our standard holiday rotation. It’s charming, funny, and sweet. It features interlocking plotlines that build on everything we know about these characters without being so complicated that you have to have seen every episode to understand. It’s on Netflix, and if you’re a fan of the show, go check it out now, before I get into the plot. It takes place either the day after the season eight holiday episode or the next year, depending on how much handwaving you want to do around the end of that episode. (The multi-species student characters featured in that episode are seen briefly at the beginning getting on the train heading out of town.) In either case, it’s the day before Hearth’s Warming Eve, and all the ponies are running about getting ready for the holidays. The opening song features a montage of fun holiday movie references while the main characters explain how busy they are. Twilight, in particular, is overwhelmed. She’s been so busy with the school that she isn’t ready for the holiday, and she not only still has to shop for gifts for her friends, she has to prepare the castle to host her brother’s family. In an effort to simplify everyone’s schedule, Applejack suggests a Secret Santa exchange, here called a Hearth’s Warming Helper. (Her big extended family makes buying individual gifts for each Apple clan member somewhat ridiculous.) The seven of them (the six main ponies and Spike) draw names out of a hat and set off to find gifts. Unfortunately, now that each of them is only shopping for one friend, they each feel pressure to find not a good gift, but the perfect gift. Spike goes to some lengths to trade for Rarity’s name, but then struggles to find anything worthy of his crush on her, finally trying (and failing repeatedly) to make a gift. Rarity orders a specially designed hat for Applejack from Manehattan. Applejack has Spike’s name, and she and Fluttershy (who has Rainbow Dash) head to a holiday gift fair. Rainbow Dash has Fluttershy, but in frustration with her mild opinions on everything, decides to just buy her a candle. Discord intervenes, challenging Rainbow’s dedication to her friendship with Fluttershy and offering to lead her to a great gift that only a speedster could obtain. Twilight has to shop for Pinkie Pie, and after much analysis, she finally decides on a famous historical magic dessert with a very specific and challenging recipe. Pinkie Pie has Twilight too, but she’s panicking over getting just one gift (she had planned to give all her friends matching hats). She heads to her friends in Yakyakistan for advice, admiring their preparations for Snilldar Fest. Prince Rutherford of the Yaks admits that they are not great gift-givers, but tells Pinkie that she can find the greatest gift-givers in the world up in the snowy mountains. And she does! We meet a trio of magic reindeer named Aurora, Bori, and Alice, who are also a spin on the fates/Christmas Carol spirits, in that one sees the past, one the present, and one the future. They give Pinkie a box that they promise is the perfect gift for Twilight. At the gift fair, Fluttershy is tricked out of her money by Flim and Flam, who are there selling cheaply made gifts that they are tricking the crowd into thinking are highly sought-after presents. Applejack and Fluttershy eventually foil their plans by convincing the shoppers instead to think about their individual loved ones rather than following the trend, but they get so caught up that they don’t have time to shop for anything better than the cheap dolls. Rarity goes to pick up her present, but it’s been delivered to the wrong address, on several levels. When she finds it, the hat has been opened by mistake by a young colt who’s obsessed with fashion despite being born an acorn farmer. After spending time with the family, Rarity decides the hat has found its real home, and she offers to host the colt at Fashion Week to mentor him and encourage his passion. Twilight gets so obsessed with creating the dessert for Pinkie that her family arrives with the castle half-decorated, and her niece Flurry Heart messes up the recipe when she isn’t looking. Rainbow Dash finds the gift indicated by Discord, an adorable fluffy creature called a winterchilla, only for it to turn into a rampaging winterZILLA when the sun goes down. Rainbow races to the castle, and all the characters become trapped at the door between the winterzilla and the messed-up pudding, now spreading exponentially like a dangerous green ooze through the halls. Fluttershy is finally able to befriend the winterzilla and calm him down, and Pinkie Pie’s mystery gift to Twilight turns out to be the specific ingredients needed to fix the pudding and turn it back into just a delicious dessert. 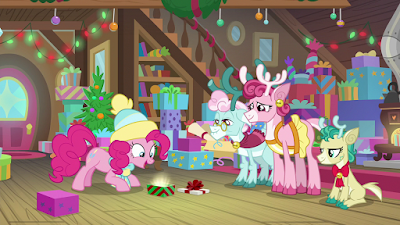 All the friends apologize for their gifts not turning out as planned (except Discord - his gift was setting up a situation where Fluttershy could save the day). In lieu of his failed craft projects, Spike sings Rarity a song, and she loves it. Pinkie Pie shares a riddle the reindeer told her, and Twilight explains that the answer is that the best gift of all is friendship. Cue a closing song, a group hug, and flying reindeer looking on. We both really enjoyed this special. It was both a touching and funny holiday story and a great extended episode of the show. It takes advantage of the expanded universe of characters without (I hope) overwhelming a viewer who’s less familiar with the show. There are lots of details in the background for eagle-eyed viewers, but the main story focuses on the core characters. I plan to watch it again soon!